The French economist came to fame with his book „Capital in the Twenty-First Century“ (Belknap Press, 2014) in which he focuses on wealth and income inequality. Nobel laureates Paul Krugman and Joseph Stiglitz called the book "the most important economics book of the year — and maybe of the decade“. Piketty is professor (directeur d’études) at the École des hautes études en sciences sociales (EHESS) and professor at the Paris School of Economics. 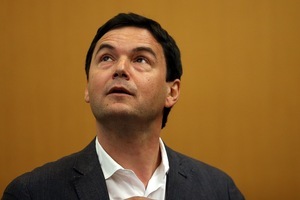 French economist Thomas Piketty has put inequality back on the map and is being hailed as the Karl Marx of the 21st century. He talked to Max Tholl and Florian Guckelsberger about a globalization gone wrong, a Eurozone parliament and our obsession with economic growth.